​Instant Pot vs Power Pressure Cooker XL which one is right for your kitchen and will it make the best possible dishes ? Quick cooking all-in-one pots, sometimes called multi-cookers, have become the newest and coolest kitchen gadget to sit on your countertop. They combine the best qualities of a slow cooker – all-in-one pot cooking, a large size for plenty of servings, and flavor infusion – with updated technological features like multiple cooking settings and faster cooking times. 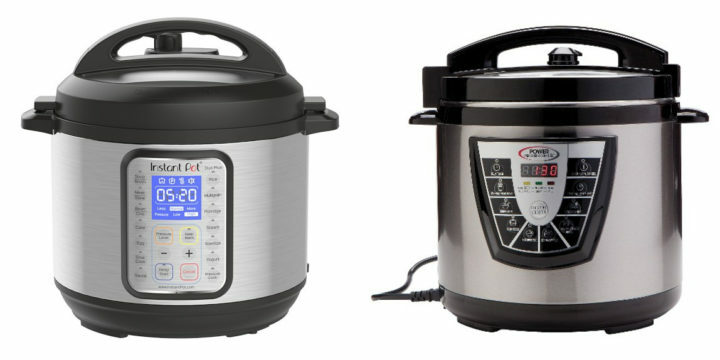 If you are in a hurry then although it was a close call between the Instant Pot vs Power Pressure Cooker the Instant Pot Duo is our pick of the two. If is made of quality stainless steel, can make a host of different recipes and it can even be used to pasteurize and sterilize. The Instant Pot is incredibly versatile. The Instant Pot, by the company of the same name, is a 3rd generation programmable pressure cooker. Nicknamed ‘The Smart Cooker,’ it comes with a free recipe app, so you can get started using it right away. There are currently four design models available in different sizes. 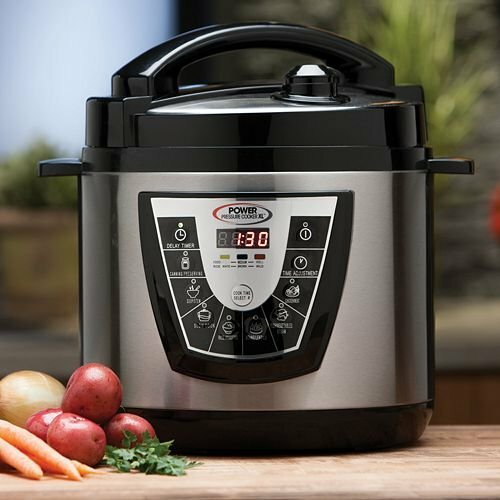 The Power Pressure Cooker, by the company of Tristar, is similar to the Instant Pot, in that it is also a slow cooker that can make meals so much faster. There is only one model available, although it does come in different quart sizes. So, in this article, we’re going to be comparing the two side by side. Which one is better? How do they compare when deciding which features are the best? Which one makes more delicious meals in the fastest times? Read on to find out more! ​The Duo Plus is a 6 Quart electronic pressure cooker that not only cooks like a traditional pressure cooker but can also be used to sterilize, cook cakes, eggs and pasteurize. Designed with safety in mind the Instant Pot Duo has an array of built in safety features. Pressure and temperature are cotinously monitored to ensure they are within normal operating limits. If any issue is detected the automatic cutoff will ensure that all power to the heater is stopped and any excess steam pressure is safely released. Cooking with the Power Pressure Cooker XL traps all the moisture and flavors inside the cooker which results in your food bursting with flavor and maintains a high nutrient level. The Power Cooker is programmable depending on what you want to cook. It has separate settings for beans, fish, meat, rich, sour, stews and vegetables. Simple load all your ingredients in to the cooker add some water or stock as necessary, press a button and then walk away.​ You'll come back to a perfectly cooked moist and succulent dish that is sure to warm the heart. A kitchen appliance’s design directly contributes to not only its appearance, but its usefulness as well. You don’t want an ugly behemoth of a machine taking up precious counter space that’s also not easy to use. The design has to make these pressure cookers a pleasure to use, so that you’re able to make delicious meals and get the most use out of it while you have it. A better designed machine also makes it easier to clean, which is definitely a bonus for an appliance that makes food! Let’s compare the designs of the Instant Pot and the Power Pressure Cooker, since they each have a distinctive look. The Instant Pot looks like a round slow cooker with a large, easy-to-read button control pad and red indicator menu. It comes in three sizes of 3 quart, 6 quart, or 8 quart. The lid, the inner pot, and the included steam rack are all made of stainless steel and are dishwasher safe for easy cleaning. The interior metal pot can be lifted out of the base. To put the lid on correctly, line up the arrow on the lid with the upward arrow on the base; otherwise, the lid won’t fit. On the underside of the lid is the pressure valve and the food blockage seal. There’s also a ringed seal, so make sure the lid is on firmly before cooking and have that gasket sealed. When taking off the lid, you want to open it away from you, so that the hot steam doesn’t blow in your face. You can actually prop the lid into the handle of the cooker base while using the inside of the pressure cooker, which is a great design feature. One noticeable design flaw is that hot steam is supposed to come out of the lid nozzle at the same time you’re switching from ‘Sealing’ to ‘Venting.’ There is the possibility you could burn yourself from the steam, so be careful with that. If you like the look of a basic slow cooker, you’ll also enjoy the hefty, no-frills appearance of the Power Pressure Cooker. This thing is built like a tank. It’s solid and round and takes up quite a bit of space on the counter. The lid is thick and heavy, with a simple twisting locking mechanism that seals in pressure. There is no way for the base to hold the lid, unlike the Instant Pot. It does have a huge, heavy handle so that you can easily lift it. There’s a steam release valve, a non-stick Teflon coated inner pot (not stainless steel, which is a real bummer), and the outside of the base is stainless steel. The front of this machine has a complete button control panel, with each one nicely marked and labeled. There’s four sizes – 6, 8, or 10 quart, as well as 8 quart deluxe. The inner pot is dishwasher safe, but not the lid. Winner: Due to its stainless steel inner pot and attractive design, the Instant Pot wins this category! When it comes to using a pressure cooker, the faster the better. Otherwise, you might as well stick with your 8-hour crock pot! Cooking times also include meal prep times, so that the entire process from whole refrigerator ingredients to a complete meal on the dinner table is shorter. In the race to deliver dinner the fastest, which pressure cooker comes out on top? Although it’s called an ‘Instant Pot,’ there are cooking times involved, but it’s much faster than a slow cooker. One negative thing that adds unexpected time to cooking is the preheating time. Before you press a button, like ‘Cake,’ you need to wait for the indicator to switch from ‘ON’ while it’s preheating to ‘HOT’ when it’s ready. That can take anywhere from five to ten minutes, in addition to cooking whatever you want. However, once the Instant Pot does start cooking your food, it’s very fast. It takes less than 10 minutes to go from frozen chicken breasts to plump, juicy chicken ready to serve, which is faster than pan-frying. This Power Pressure Cooker has the same issue with preheating times as the Instant Pot, and it does cook ten times faster than oven-based or slow cooker-based dishes. The cooking times are about the same as the Instant Pot, perhaps give or take a couple of minutes, but nothing that really sets these two apart. Winner: In this category, it’s a tie! What are the types of meals and how many kinds of meals can you cook in each of these pressure cookers? This category is important, since you want plenty of variety in the things you can make. That way, you’ll get the most use out of your Instant Pot or Power Pressure Cooker. You’ll also be able to enjoy dozens of tasty meals for your family and friends for many months and years to come. You can make all kinds of dishes in the Instant Pot, thanks to its multi-cooker functionality. You can make any soup, stew, broth, chili, one-pot, porridge/oatmeal, or slow cooker recipe, which gives you thousands of options. It also sautés or browns meats, makes yogurt, bakes a cake, cooks eggs or rice, and can be used to steam veggies as well. You can even sterilize jars for homemade canning! While it can make thousands of recipes, what can’t it do? This is not a fryer, so if you’re looking for crispy chicken skin, you’ll need a different appliance. Besides the ‘Cake’ function, it’s not primarily a baking machine for brownies, cupcakes, or cookies. Also, it can’t roast vegetables or meats on a sheet pan or broil like an oven can. You wouldn’t want to make a casserole dish in this, either. You can cook all kinds of dishes with the Power Pressure Cooker. It has buttons on the front for soup/stew, rice/risotto, beans/lentils, fish/vegetables steaming, chicken/meat, and even canning/preserving. However, there are no baking functions, egg cooking functions, or a yogurt maker included with this, like there is with the Instant Pot. It doesn’t cook as many recipes. Winner: The Instant Pot wins this category for sheer variety! There’s nothing more frustrating than getting a new kitchen appliance, only to spend hours poring over a thick manual and trying to figure out how it works; this makes you not want to use it at all! So, in this category, we’ll be comparing these two pressure cookers to see just how easy they are to operate. That way, you can spend less time figuring out what each button means and more time prepping vegetables for tonight’s dinner. The control button pad has plenty of buttons to cook a variety of foods with many methods, including sauté, steam, rice, yogurt, soup, meat, cake, egg, and slow cooking. To switch from one to the next, you need to press ‘Warm/Cancel’ first. You can also simply plug in a cooking time, similar to an oven. The buttons are large and easy to read. Each one beeps as soon as you press it. It also beeps to let you know it’s preheated and beeps when it’s time to vent the steam. It’s easy to use the Power Pressure Cooker. As soon as you plug it in, it’s turned on. There’s no power button. To cook your food, just push the appropriate button on the front, which is pre-programmed with times. You’ll also see it cycle on, which means it’s preheating. The buttons are also large and easy to read. You can add ingredients right to the pot. You put the lid on and you have to lock it. When you start cooking, it should be in ‘Pressure’ mode. Once the lid locks, the pressure starts, and the machine will count down all by itself based on the timer settings you plugged in earlier. There’s a quick release method. You flip the switch to the steam, which releases it for about a minute or two. It unlocks automatically. Winner: Due to ease of use, the Power Pressure Cooker wins this category. Are you a 5-star chef on a home cook’s budget? Then you definitely want to compare the costs of both the Instant Pot and the Power Pressure Cooker. Let’s look at not only the cost of the machine itself, but its extraneous expenses including accessories, maintenance, and repairs. Which one gives you the better bang for your buck? The Instant Pot costs more than the Power Pressure Cooker, so it does not win in the least expensive category. However, it will probably last longer, because it’s made of more durable materials and has a more ‘expensive’ feel. This machine is a lot less expensive than the Instant Pot, and it even comes in two sizes. You can purchase separate accessories with it, though. Winner: The Power Pressure Cooker is better for those on a budget. Instant Pot vs Power Pressure Cooker: Which is the Winner? Gone are the days of danger associated with too much pressure. When it comes to using the Instant Pot and the Power Pressure Cooker, you can have delicious slow cooker style meals that are better in flavor and on the table in a fraction of the time. Both these machines are stand out winners. Which one is better for you? Let’s look at the winners of each category. Each gets a score of three, so they’re tied. The Power Pressure Cooker is great for those on a budget and is easy to use right out of the box. The Instant Pot is more complicated and pricier, but it’s built to last and cooks a lot more recipes. Choose whichever you like best!